I hope you have had a fantastic weekend! Today was a stormy day in Vancouver which I spent snuggled up in bed with my computer watching bad TV and drinking tea. It was amazing. I had big plans to go into the lab to get ahead on my work for the week, but obviously that didn’t end up happening and that’s ok. I found this past week exhausting, so it was great to take a day completely off. On Saturday I attended Creating Connections 2.0 which AJung discussed in an earlier blog post and it was fantastic! It was an all day conference geared towards women students and professionals in science and engineering. The day was very interactive and the style of the individual events varied throughout the day which I found really helped keep my energy level up. Public speaking isn’t one of my favourite things to do, so I attended all of the public speaking/networking workshop sessions and left with an “elevator pitch” and lots of tips on how to engage an audience and make effective presentations which will hopefully help. If you are/will be at UBC next year, I recommend looking into attending. Making a business card is a tricky thing! I want it to look professional and to “fit in” with the style the cards I’ve seen from people working in industry, but I also want it to stand out enough to not get lost in a pile of similar, or worse, more interesting looking cards. I decided to essentially copy my name and address section from my resume so the styles of the two match and become my “brand” design. 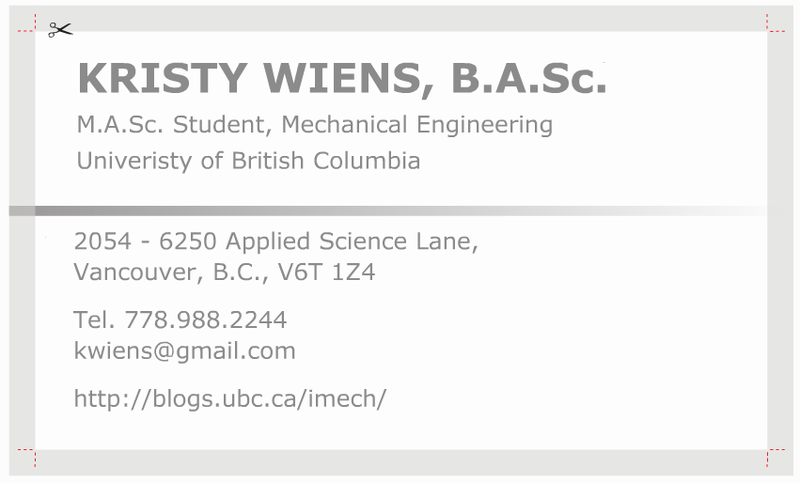 I’m not sure if it is a mistake to not have any color on the card and may change the stripe in the centre to a green gradient instead of grey, but I have the same stripe on my resume and really like the idea of them matching! I’ll sleep on it anyway. I would love to hear what you think of it, and what you think makes a really great business card! This entry was posted in Surviving Grad School on September 25, 2011 by kwiens. So, a few days ago, my sister sent me a quick email to cheer me up, saying ‘I hope you aren’t on the verge of breaking down’. She usually sends me songs to motivate me through the week/day etc. This time, she had sent me the Jacob Lusk version of the song “I believe I can fly”. You guys all know the song right? By then, I was suffering from a thesis coma of some sort (?) and was passed out in the lab by the contents of my thesis against will. Anywho, as soon as I heard the lyrics of the famous song, I had to edit it to make it relevant to my life. Almost instantly, I had my masterpiece of the day… a song called “I believe I can pass”. For those of you who doesn’t know the song, or don’t have a mp3 of it, try listing to it on Youtube on the background while singing to the edited lyrics. Trust me, it’ll boost up your energy for those of you writing your thesis right now. I think some super talented band/singer should make this into a recording. Please… all of us can use some of this motivation. 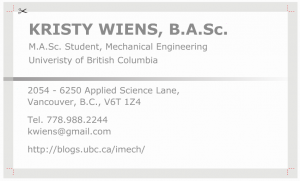 This entry was posted in Surviving Grad School, UBC Grads 101 on September 15, 2011 by AJung. Tightwad Grad Student: Make a Frappuccino for $0.32! I bought a MonerySense magazine (Sept/Oct 2011) the other day, and they had an exciting recipe to make a Frappuccino for only $0.32 (see pg. 11)! This entry was posted in Finances on September 12, 2011 by kwiens.